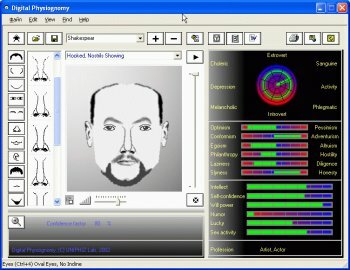 Digital Physiognomy allows anyone to recognize personality traits of others. You select eyes, brows, foreheads, etc. to assemble an identical image of a face. It uses a sophisticated neural network to identify correlations between facial features and psychological characteristics. The program does not forecast the future but discovers how others really see you. You gain accurate insight into the true nature of famous people. Physiognomy and phrenology are forms of pseudoscientific quackery that have been discredited for hundreds of years. Don't encourage this nonsense.